"On behalf of Synopsys I want to take the opportunity to thank you for the outstanding leadership and support that you have provided to Synopsys. You have been a valued partner for the past six years, bringing your unsurpassed experience and boundless enthusiasm to our business and helping us to build a world class information protection program. As the industry leader in electronic design automation, our customers look to us to help them with their most complex design challenges. We need our customers to share their most valued information, their intellectual property with us. This is a requirement so that we can work closely to service their design needs. We have been successful in developing key partnerships, supporting leading chip manufacturers and delivering the best products and services based on trust. You, Naomi, have made this possible. Our IP program, which you have helped us to develop, has allowed us to provide more then assurances, we have a well-established, documented and implemented program for information protection. It has been your insight, knowledge and leadership that has driven this program. Your experience and driving convictions have made it possible for Synopsys to lead our industry in Information Protection. Synopsys can never thank you sufficiently for your part in our continued success. We hope that you will continue to bring your expertise and leadership to Synopsys in the coming year." "As you know, I was recently interviewed by Fortune Magazine for an article about the challenge and importance of protecting confidential business information. During my discussion with the journalist, I had many opportunities to describe the advantage of working with you as an expert consultant who is able to tailor an information protection strategy to the specific needs of a company. Since my statements of respect and appreciation were not quoted in the Fortune article, I thought I would include them here for your benefit. In my former position as Associate General Counsel and Intellectual Property Counsel at VLSI, I worked with you extensively developing and designing a plan to implement a comprehensive information protection program. I appreciated the way you helped lead our interdisciplinary task force. You brought important insights to our discussions and helped to facilitate productive meetings. The work products you developed for VLSI, which included policies and the SOS (Save Our Secrets) educational materials, were thorough and user-friendly. More recently I asked you to help update the information protection program here at 3Com. I was impressed with your willingness and ability to take a somewhat different approach, consistent with the 'keep it simple' philosophy that I felt would be most effective at 3Com. Your work product was comprehensive, yet concise and within our agreed budget. It has been a pleasure working with you, and I will look forward to continuing to look to you as a valuable resource in the area of information protection. I would be happy to be available as a reference to any of your potential clients." "I am writing you to let you know of the on-going success of the comprehensive information protection program you developed and helped to implement for Adaptec. The survey approach you used to begin the development of our program was particularly helpful in identifying our confidential information and understanding our priorities for reducing our highest risks of information loss. The information protection policy you developed for us continues to be the backbone of our highly effective information protection program and the comprehensive audit materials you provided to help us confirm compliance are excellent tools. While the "Keep the Magic" employee handbook is our primary employee reference for information protection, we maintain a high level of awareness by distributing your monthly newsletter, Information Protection Tips of the Month. We are particularly pleased with the cost-effectiveness of this subscription. On a personal note, I appreciate your even mix of professionalism and friendliness. You were well received as an expert presenter for our management training. You built strong relationships with members of our security organization and legal department, and made excellent impressions on the executive management of Adaptec during your presentations and meetings with them. I offer my thanks to you again for your superb assistance in developing an exceptional information protection program for Adaptec." "We enjoy the association with your firm and are also grateful for the many contributions you make toward our success." "Naomi Fine provided services as a consultant for Apple regarding Information Protection during our initial planning and development stages in this area. She made a significant contribution to starting the Apple Information Protection Program and forming the basis for future work at Apple in the Information Protection area. Naomi did a very good job and delivered what was expected of her. She delivered training material and designed training classes. She also prepared all written material that was distributed to a network of coordinators. She conducted herself in a professional manner and was always willing to devote whatever time and energies were required. She was dedicated and consistently demonstrated content knowledge and leadership skills. I recommend her strongly for positions involving Information Protection." "My team and I thoroughly appreciated your view of IP Protection, and believe we will be a stronger company due to your contribution at Genus." "I take great pleasure in reflecting on the project I have shared with you. Your knowledge and breadth of experience in protecting proprietary information and the Economic Espionage Act were key to implementing an effective program in our Technology Division. You directed our task team's energies into meaningful steps, providing a means of protecting the assets of International Paper. In addition, you aided International Paper in instituting a compliance program for the Economic Espionage Act of 1996. Your presentation skills and professional, yet thoughtful mannerisms, made me proud to recommend you to our most senior management. As I commence the deployment of the strategies you helped us create, I look forward to working with you again to address the specific needs of our many business groups." "Thank you for the fine work and guidance in the field of intellectual property protection. 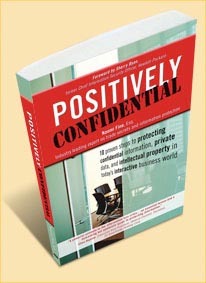 As you know, the word and enthusiasm is spreading for protecting all types of confidential information. Your help and sincerity along with your vast knowledge of the subject matter has certainly provided the underpinning of an excellent program here. I also compliment you on your networking skills. The best contacts and information are obtained through networking. References which you provided and contacts you made for me have been valuable. Congratulations on your on-going success with your business." "As you know, the R&S/DPR litigation settled on the eve of trial. I write to thank you for the fine work you did as an expert on protection of proprietary information and to offer to serve as a reference for any future expert work you may be considered for. One of the most rewarding aspects of working on this case was the opportunity to work with the experts retained by this office. Out of the eleven experts retained for this case, I had the pleasure of working directly with eight experts, including you. In this stellar group of experts, you were among the most articulate and thoughtful. At all times, your work product was excellent and exceeded both my needs and expectations. It was a great pleasure to work with you. You will be the first person I call when I have another case involving information protection." "We at Levi Strauss & Co. want to express our sincere and great appreciation for your invaluable assistance with our information classification, trading partner, and extranet projects. In seeking a consultant to assist us with the daunting challenge of classifying the information in our global company, we knew we must find someone who could demonstrate practical, hands-on experience. Because two earlier tedious efforts had ended unsuccessfully, the consultant also needed the flexibility and drive to adapt to our unique corporate culture. We feel as though we struck gold when we found you! Without the depth of your information protection knowledge and experience, our project might well have gone the way of those earlier efforts. The superb quality of your work enables us to point with pride to the brochure detailing our company's sensitive information and information protection principles. Your friendly style, professionalism and vast industry experience led us to quickly conclude that your involvement would be valuable to our trading partner and extranet security effort. Your contributions were key to the success of this important effort, too. The teams involved in these efforts are grateful to you and appreciate your contributions to both important projects. We look forward to working with you on other elements of our information protection program at Levi Strauss & Co."
"I want to thank you, on behalf of McDonald's Corporation, for your assistance with the design and with the initial drafts of our information protection program. Your insights and contributions during the program's conceptual stage were highly valued by all of the individuals involved with the project. From those initial efforts, a world-class information protection program has evolved to serve today's security needs at McDonald's, while remaining flexible and adaptable to our future needs. Your vast industry experience and knowledge of security needs greatly contributed to our efforts. Thank you again for your valuable assistance in developing our protection program." "Many thanks to you for your guidance and extensive time spent on the Manager's Guide for Protecting Information and Property Shared with Non-MCIers. Although many contributed to the form and content of the package, your work was the basis for the development of the final package from start-up to finish. Your efforts have brought us closer to achieving our real goal -- Protecting MCI Business Information. Thank you again for your outstanding work. " "I want to thank you for your outstanding assistance during my tenure as Director of Corporate Security for MicroUnity Systems Engineering, Inc. Your professionalism, and that of your colleagues, in working with us to develop and implement a comprehensive information protection program was invaluable to us. As you know, our intellectual property and other proprietary information was literally the lifeblood of our corporation and proved, over time, to be the only product we produced. Because of my personal and professional admiration of your contributions to security management, I have on several occasions referred my professional colleagues to your firm for assistance, and I will certainly continue to be happy to do so, as well as referring my clients, now that I am employed as a management consultant, to you when I see they are in need of your particular expertise." "Our sincere thanks to you for providing Pro-Tec Data's comprehensive information protection program to The Nature Conservancy. Today's staff training session, together with the risk assessment survey Pro-Tec Data performed for us, make up an invaluable and very relevant set of tools for helping our staff identify and protect our confidential information. As an organization which focuses much effort in getting our message out, it was eye-opening for us to spend some time thinking about the kinds of information we need to protect in order to enhance our effectiveness. I could tell from the number of questions and comments from our staff that the session was very worthwhile time spent. Even our director of human resources commented afterward on the importance of offering this training session across the organization worldwide. I found your presentation style particularly engaging. The pace of your delivery and the relevance of your examples captured everyone's attention on this important subject. The slides were well tailored to our particular issues. We very much appreciate the time and thought you put into this information protection program. Please feel free to use us as a reference. I would be happy to describe your work and its value to our organization to any company considering your services." "As you know, our challenge at Nortel has been to establish an information protection program in a fast-paced, global, technology company. I am writing to acknowledge your ability to help us at both the strategic level, defining our vision for an enterprise-wide program, and at the practical level, providing solutions which help to integrate information protection procedures into our key business processes. You were highly recommended by our Vice President, Corporate and Systems Security, as well as our former Director of Security Policy and Planning. I heard from them that you have done an outstanding job developing our information protection policy and related communications materials. The benchmark study you conducted on behalf of Nortel to determine how leading companies protect information transmitted electronically to business partners in developing countries was a valuable contribution to our international information protection efforts. From my own experience working with you, I am impressed with the industry experience you bring to the table. The scope of your projects for Nortel, which include policy drafting, technical benchmark studies, strategic vision development, and recommending practical information security solutions, speaks for the breadth of your capabilities. On a personal note, it has been particularly satisfying to work with someone as responsive and results-oriented as you are. Together we have been able to exceed expectations and prepare Nortel for the future." "You helped us face a key challenge in moving from the security of a regulated monopoly to the uncertainty of operating in the environment of deregulation. Success in our new business environment requires a significant change in our corporate culture. You contributed significant skills and insights critical to the vision and strategic implementation of PECO's corporate culture changes as it related to information protection. You certainly lived up to our high expectations. You were very effective at keeping our team focused on priority issues. This was particularly useful in helping our Executive management Team understand how our information protection strategy is tied to our overall corporate objectives. For these contributions, as well as your patience and cheerful approach, I thank you on behalf of PECO Energy. I look forward to continuing our working relationship..."
"I want to thank you on behalf of Rockwell for your professional assistance in developing our program for the protection of sensitive business information. The questionnaire you developed for us to benchmark best business practices proved to be very valuable and enabled us to learn from the ideas and mistakes of others. The policy draft on Safeguarding Company Sensitive Information that you provided was exceptionally well constructed, all encompassing, yet brief and to the point. Finally, the tools you provided us to create the pilot program at our Space Systems Division will serve us well for corporate-wide implementation. In all, your help and assistance was well received. You have our thanks." "I greatly admired your work. Your program was thoughtful, to the point, and very practical. hope that we will have the opportunity to work together again some day. The information materials concerning Pro-Tec Data were very interesting." "I want to express my appreciation for the outstanding assistance you have provided in connection with the development of our Information Protection Program. Your highly knowledgeable, professional and proactive assistance has made the difference between just another corporate policy and a broad, well-thought-out and well executed program. Thanks to you, our employees are now much more sensitive to the need to protect confidential information, and they have the knowledge and tools for doing so effectively. Perhaps the best testimony to the success of the program is that the value of protecting confidential information and the day-to-day practices to do that have now become part of our culture. Thank you, Naomi, for your outstanding services. Working with you has been both a personal pleasure and a demonstrable value to our company." "Thanks for your gracious message and your excellent presentation. You have done a great job for Synopsys. You are in every respect a class act and are clearly in the 'Top 1%' of all the people we deal with in any domain." The inception of a comprehensive information program that would succeed in the open Tandem corporate culture. Working with a cross-functional team of representatives from Computer Security, Corporate Security, Legal, and our Human Resources departments, you helped us to develop and implement all phases of our program, including the overall strategy, and related policies and procedures. You worked closely with our MIS group to develop policies and procedures that resulted in an outstanding comprehensive computer systems security program. The employee communications program you helped us develop, including training videos, handbooks, posters, fliers, and internal televised interactive programs, continue to be very effective in maintaining the awareness the program demands. I personally appreciate your vast industry experience and the quality of your work. I thank you again for your assistance in developing a timeless, world-class information protection program for Tandem. " "I want to express my thanks and appreciation to you and your accomplished staff at Pro-Tec Data for the outstanding assistance you provided to USF&G in the development of our Intellectual Property Protection Program. Specifically, I commend your expert advice and counsel which helped us to reengineer our intellectual property protections directly into critical project development processes. You were thorough and competent in assisting us to identify our vulnerabilities and directing us to take the necessary steps to ensure protection of our intellectual property. Not only did you address our existing needs, but we are now well positioned to protect our future technology initiatives. You provided us with quality deliverables in a timely manner and not only met, but exceeded our expectations. Your products and services reflect your commitment to offering the very best. It has been a pleasure working with you. As we continue the implementation of the program, I welcome the opportunity to continue this synergistic relationship." "I want to express my thanks to you and to Pro-Tec Data for your professional assistance in improving Varian's protection of confidential and sensitive information. Specifically, I appreciated your flexibility in developing a cost effective, overall company strategy that could be implemented through programs tailored to the individual needs of our businesses. The measure of success of these programs has been the businesses' adherence to and continuing use of the policies and practices you developed for them. I believe that this is due in significant part to your close working relationship with the business managers, your follow through, and the excellent manuals and materials you distributed as "tools" the managers could understand and apply. Indeed, I already have several 'war stories' concerning incidents where the tools and techniques from the programs proved most useful in practice. Personally, it was a pleasure working with you. Your commitment to excellence, your planning and your persistence helped me achieve important goals and implement programs that will provide enduring value to Varian."